We are engaged in manufacturing and exporting of Watt meter Calibrator. 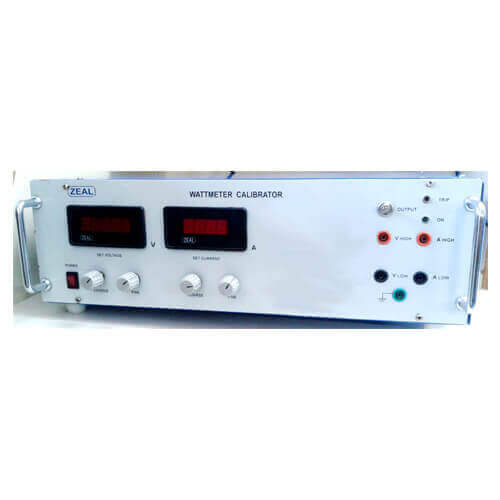 Calibrator has high precision voltage and current outputs with excellent stability and accuracy. Widely used in lab and field as a single phase standard source or single phase phantom load source. User can set voltage ,current, power factor (lead/lag) and vary frequency. The sine waves of voltage and current are synchronized. Phase angle between Voltage and current can be shifted in all 4 quadrants. Setting by Multi turn potentiometers for V/A. Setting : By coarse and fine set of potentiometer for Voltage and Current By potentiometer for power factor.